"Cannas" redirects here. For other uses, see Canna (disambiguation). Canna (or canna lily, although not a true lily) is a genus of 10 species of flowering plants. The closest living relations to cannas are the other plant families of the order Zingiberales, that is the Zingiberaceae (gingers), Musaceae (bananas), Marantaceae, Heliconiaceae, Strelitziaceae, etc. Although a plant of the tropics, most cultivars have been developed in temperate climates and are easy to grow in most countries of the world as long as they receive at least 6–8 hours average sunlight during the summer, and are moved to a warm location for the winter. See the Canna cultivar gallery for photographs of Canna cultivars. The name Canna originates from the Latin word for a cane or reed. The plants are large tropical and subtropical perennial herbs with a rhizomatous rootstock. The broad, flat, alternate leaves that are such a feature of this plant, grow out of a stem in a long, narrow roll and then unfurl. The leaves are typically solid green, but some cultivars have glaucose, brownish, maroon, or even variegated leaves. The flowers are composed of three sepals and three petals that are seldom noticed by people, they are small and hidden under extravagant stamens. What appear to be petals are the highly modified stamens or staminodes. The staminodes number (1–) 3 (–4) (with at least one staminodal member called the labellum, always being present. A specialized staminode, the stamen, bears pollen from a half-anther. A somewhat narrower 'petal' is the pistil which is connected down to a three-chambered ovary. The flowers are typically red, orange, or yellow or any combination of those colours, and are aggregated in inflorescences that are spikes or panicles (thyrses). Although gardeners enjoy these odd flowers, nature really intended them to attract pollinators collecting nectar and pollen, such as bees, hummingbirds, sunbirds, and bats. The pollination mechanism is conspicuously specialized. Pollen is shed on the style while still in the bud, and in the species and early hybrids some is also found on the stigma because of the high position of the anther, which means that they are self-pollinating. Later cultivars have a lower anther, and rely on pollinators alighting on the labellum and touching first the terminal stigma, and then the pollen. The wild species often grow to at least 2–3 m (6.6–9.8 ft) in height, but there is a wide variation in size among cultivated plants; numerous cultivars have been selected for smaller stature. Cannas grow from swollen underground stems, correctly known as rhizomes, which store starch, and this is the main attraction of the plant to agriculture, having the largest starch particles of all plant life. 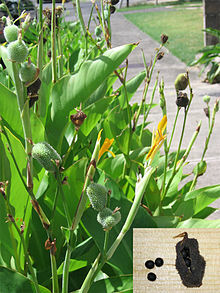 Canna is the only member of the Liliopsida class (monocot group) in which hibernation of seed is known to occur, due to its hard, impenetrable seed covering. Canna indica, commonly called achira in Latin America, has been cultivated by Native Americans in tropical America for thousands of years and was one of the earliest domesticated plants in the Americas. The starchy root is edible. The first species of Canna introduced to Europe was C. indica L., which was imported from the East Indies, though the species originated from the Americas. Charles de l'Ecluse, who first described and sketched C. indica, indicated this origin, and stated that it was given the name indica, not because the plant is from India, in Asia, but because this species was originally transported from America: Quia ex America primum delata sit; and at that time, one described the tropical areas of that part of the globe as the Western Indies. Much later, in 1658, Willem Piso made reference to another species which he documented under the vulgar or common name of 'Albara' and 'Pacivira', which resided, he said, in the 'shaded and damp places, between the tropics'; this species is Canna angustifolia L. (later reclassified as C. glauca L. by taxonomists). Without exception, all Canna species that have been introduced into Europe can be traced back to the Americas, and it can be asserted with confidence that Canna is solely an American genus. If Asia and Africa provided some of the early introductions, they were only varieties resulting from C. indica and C. glauca cultivars that have been grown for a long time in India and Africa, with both species imported from Central and South America. Since cannas have very hard and durable seed coverings, it is likely that seed remains would survive in the right conditions and been found by archaeologists in the Old World if Canna had been grown there from antiquity. If the soils of India or Africa had produced some of them, they would have been imported before the 1860s into European gardens. Although most cannas grown these days are cultivars (see below), there are approximately 20 known species of the wild form, and in the last three decades of the 20th century, Canna species have been categorized by two different taxonomists, Paul Maas, from the Netherlands and Nobuyuki Tanaka from Japan. Both reduced the number of species from the 50-100 accepted previously, assigning most as synonyms. This reduction in species is also confirmed by work done by Kress and Prince at the Smithsonian Institution; however, this only covers a subset of the species range. See List of Canna species for full species information and descriptions. The genus is native to tropical and subtropical regions of the New World, from the southern United States (southern South Carolina west to southern Texas) and south to northern Argentina. Canna indica has become naturalized in many tropical areas around the world, is a difficult plant to remove, and is invasive in some places. Canna cultivars are grown in most countries, even those with territory above the Arctic Circle, which have short summers but long days, and the rapid growth rate of cannas makes them a feasible gardening plant, as long as they receive 6–8 hours of sunlight each day during the growing season and are protected from the cold of winter. Cannas are largely free of pests, but in the US, plants sometimes fall victim to the canna leaf roller moth, and the resultant leaf damage, while not fatal to the plant, can be most distressing to a keen gardener. Slugs and snails are fond of cannas and can leave large holes in the leaves, preferring the tender young unfurled leaves. Red spider mites can also be a problem for cannas grown indoors or during a very hot, long summer outdoors. Japanese beetles can also ravage the leaves if left uncontrolled. Cannas are remarkably free of diseases, compared to many genera. However, they may fall victim to canna rust, a fungus resulting in orange spots on the plant's leaves, caused by over moist soil. They are also susceptible to certain plant viruses, some of which are Canna-specific, which may result in spotted or streaked leaves, in a mild form, but can finally result in stunted growth and twisted and distorted blooms and foliage. The flowers are sometimes affected by a grey, fuzzy mold called botrytis. Under humid conditions, it is often found growing on the older flowers. Treatment is to simply remove the old flowers, so the mold does not spread to the new flowers. Cannas grow best in full sun with moderate water in well-drained rich or sandy soil. They grow from perennial rhizomes, but are frequently grown as annuals in temperate zones for an exotic or tropical look in the garden. In arid regions, cannas are often grown in the water garden, with the lower inch of pot submerged. In all areas, high winds tear the leaves, so shelter is advised. The rhizomes are sensitive to frost and will rot if left unprotected in freezing conditions. In areas with winter temperatures below −10 °C (14 °F) in the winter (< USDA Zone 8b), the rhizomes can be dug up before freezing and stored (above 7 °C or 45 °F) for replanting in the spring. Otherwise, they should be protected by a thick layer of mulch over winter. Detail of the seed pods and seeds: The seeds are used for jewelry and musical instruments. Some species and many cultivars are widely grown in the garden in temperate and subtropical regions. Sometimes, they are also grown as potted plants. A large number of ornamental cultivars have been developed. They can be used in herbaceous borders, tropical plantings, and as a patio or decking plant. The seeds are used as the mobile elements of the kayamb, a musical instrument from Réunion, as well as the hosho, a gourd rattle from Zimbabwe, where the seeds are known as hota seeds. In more remote regions of India, cannas are fermented to produce alcohol. The plant yields a fibre from the stem, which is used as a jute substitute. A fibre obtained from the leaves is used for making paper. The leaves are harvested in late summer after the plant has flowered, they are scraped to remove the outer skin, and are then soaked in water for two hours prior to cooking. The fibres are cooked for 24 hours with lye and then beaten in a blender. They make a light tan brown paper. In Thailand, cannas are a traditional gift for Father's Day. In Vietnam, canna starch is used to make cellophane noodles known as miến dong. See the List of Canna cultivars for photographs of Canna cultivars. Cannas became very popular in Victorian times as garden plants and were grown widely in France, Germany, Hungary, India, Italy, the United Kingdom, and the United States. Some cultivars from this time, including a sterile hybrid, usually referred to as Canna × ehemannii, are still commercially available. C. × ehemannii is tall and green leafed with terminal drooping panicles of hot pink iris like flowers, looking somewhat like a cross between a banana and a fuchsia. As tender perennials in northern climates, they suffered severe setbacks when two world wars sent the young gardening staff off to war. It took many years for the frugalities of war and its rationing subsequences to change to the more prosperous times of the late 20th century. The genus Canna has recently experienced a renewed interest and revival in popularity. Once, hundreds of cultivars existed, but many are now extinct. In 1910, Árpäd Mühle, from Hungary, published his Canna book, written in German. It contained descriptions of over 500 cultivars. In recent years, many new cultivars have been created, but the genus suffers severely from having many synonyms for many popular ones. Most of the synonyms were created by old varieties resurfacing without viable names, with the increase in popularity from the 1960s onwards. Research has accumulated over 2,800 Canna cultivar names, but many of these are simply synonyms. See List of Canna hybridists for details of the people and firms that created the current Canna legacy. In the early 20th century, Professor Liberty Hyde Bailey defined, in detail, two 'garden species' (C. × generalis and C. × orchiodes) to categorise the floriferous cannas being grown at that time, namely the Crozy hybrids and the 'orchid-like' hybrids introduced by Carl Ludwig Sprenger in Italy and Luther Burbank in the USA, at about the same time (1894). The definition was based on the genotype, rather than the phenotype, of the two cultivar groups. Inevitably, over time those two floriferous groups were interbred, the distinctions became blurred and overlapped, and the Bailey species names became redundant. Pseudo-species names are now deprecated by the International Code of Nomenclature for Cultivated Plants which, instead, provides Cultivar Groups for categorising cultivars (see groups at List of Canna cultivars). The Canna Agriculture Group contains all of the varieties of Canna grown in agriculture. 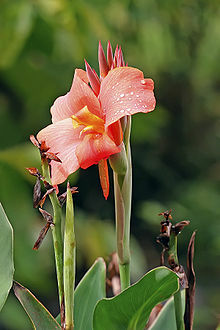 "Canna achira" is a generic term used in South America to describe the cannas that have been selectively bred for agricultural purposes, normally derived from C. discolor. It is grown especially for its edible rootstock from which starch is obtained, but the leaves and young seeds are also edible, and achira was once a staple food crop in Peru and Ecuador. Trials in Ecuador using a wide range of varieties have shown that achira can yield on average 56 tons of rhizomes and 7.8 tons of extractable starch per hectare. However, the crop needs 9–12 months to mature to full productivity. Many more traditional kinds exist worldwide; they have all involved human selection, so are classified as agricultural cultivars. Traditionally, Canna edulis Ker Gawl. has been reputed to be the species grown for food in South America, but C. edulis probably is simply a synonym of C. discolor, which is also grown for agricultural purposes throughout Asia. Seeds are produced from sexual reproduction, involving the transfer of pollen from the stamen of the pollen parent onto the stigma of the seed parent. In the case of Canna, the same plant can usually play the roles of both pollen and seed parents, technically referred to as a hermaphrodite. However, the cultivars of the Italian Group and triploids are almost always seed sterile, and their pollen has a low fertility level. Mutations are almost always totally sterile. Canna seeds have a very hard seed coat, which contributes to their dormancy. Germination is facilitated by scarification of the seed coat, which can be accomplished by several techniques. The species are capable of self-pollination, but most cultivars require an outside pollinator. All cannas produce nectar, so attract nectar-consuming insects, bats, and hummingbirds, that act as the transfer agent, spreading pollen between stamens and stigmas on the same or different flowers. Since genetic recombination has occurred, a cultivar grown from seed will have different characteristics from its parent(s), thus should never be given a parent's name. The wild species have evolved in the absence of other Canna genes and are usually true to type when the parents are of the same species, but a degree of variance still occurs. The species C. indica is an aggregate species, having many different and extreme forms ranging from the giant to miniature, from large foliage to small foliage, both green and dark foliage, and many different coloured blooms, red, orange, pink, and yellow, and combinations of those colours. Outside of a laboratory, the only effective asexual propagation method is rhizome division. This uses material from a single parent, and as there is no exchange of genetic material, it almost always produces plants that are identical to the parent. After a summer’s growth, the horticultural cultivars can be separated into typically four or five separate smaller rhizomes, each with a growing nodal point ('growing eye'). Without the growing point, which is composed of meristem material, the rhizome will not grow. Micropropagation, also known as tissue culture, is the practice of rapidly multiplying stock plant material to produce a large number of progeny plants. Micropropagation uses in vitro division of small pieces in a sterile environment, where they first produce proliferations of tissue, which are then separated into small pieces that are treated differently so that they produce roots and new stem tissue. The steps in the process are regulated by different ratios of plant growth regulators. Many commercial organizations have produced cannas this way, and specifically the “Island Series” of cannas was introduced by means of mass-produced plants using this technique. However, cannas have a reputation for being difficult micropropagation candidates. Micropropagation techniques can be employed to disinfest plants of a virus. In the growing tip of a plant, cell division is so rapid that the younger cells may not have had time to be infected with the virus. The rapidly growing region of meristem cells producing the shoot tip is cut off and placed in vitro, with a very high probability of being uncontaminated by virus. ^ a b c Tanaka, N. 2001. Taxonomic revision of the family Cannaceae in the New World and Asia. Makinoa ser. 2, 1:34–43. ^ "canna, n.1." OED Online. Oxford University Press, June 2014. Web. 16 August 2014. ^ FAO, "Canna edulis", accessed 23 Feb 2016. ^ Lamarck, Jean-Baptiste. Botanical Encyclelopédie. ^ Paul Maas 1985. 195. Cannaceae. & Maas, P. J. M. and H. Maas. 1988. 223. Cannaceae. ^ "RHS Plant Selector - Canna 'Alaska'". Retrieved 16 July 2013. ^ "RHS Plant Selector - Canna 'Annaeei'". Retrieved 16 July 2013. ^ "RHS Plant Selector - Canna × ehemanii". Retrieved 16 July 2013. ^ "RHS Plant Selector - Canna 'Erebus'". Retrieved 16 July 2013. ^ "RHS Plant Selector - Canna 'General Eisenhower'". Retrieved 16 July 2013. ^ "RHS Plant Selector - Canna 'Louis Cayeux'". Retrieved 16 July 2013. ^ "RHS Plant Selector - Canna 'Musifolia'". Retrieved 16 July 2013. ^ "RHS Plant Selector - Canna 'Mystique'". Retrieved 16 July 2013. ^ "RHS Plant Selector - Canna 'Phasion'". Retrieved 16 July 2013. ^ "RHS Plant Selector - Canna 'Picasso'". Retrieved 16 July 2013. ^ "RHS Plant Selector - Canna indica 'Russian Red'". Retrieved 16 July 2013. ^ "RHS Plant Selector - Canna 'Shenandoah'". Retrieved 16 July 2013. ^ "RHS Plant Selector - Canna 'Verdi'". Retrieved 16 July 2013. ^ "RHS Plant Selector - Canna 'Withelm Pride'". Retrieved 16 July 2013. ^ "RHS Plant Selector - Canna 'Wyoming'". Retrieved 16 July 2013. ^ "Aloha 'Aina Jewelry". Archived from the original on 2008-05-03. Retrieved 2008-03-03. ^ Constructed wetland for on-site septic treatment. ^ Grant, Greg (2011). Heirloom Gardening in the South. College Station, Texas: Texas A&M University Press. p. 187. ^ "Canna Synonyms". Archived from the original on 2007-07-01. Retrieved 2008-02-04. ^ Hermann, Michael (1995–1996). Crop growth and starch productivity of edible canna. International Potato Center. pp. 295–301. ^ Nobuyuki Tanaka (2004). "The utilization of edible Canna plants in southeastern Asia and southern China". Economic Botany. 58 (1): 112–114. doi:10.1663/0013-0001(2004)058[0112:noep]2.0.co;2. JSTOR 4256780. ^ "On the Genus Canna in Yaeyama Islands, the Ryukyus, Japan". Archived from the original on 2007-09-28. Retrieved 2007-07-02. ^ "Edible Canna and its Starch: An Under-Exploited Starch-Producing Plant Resource" (PDF). Archived from the original (PDF) on 2008-02-27. Retrieved 2007-07-02. ^ Progress in the Development of Economic Botany and Knowledge of Food Plants. ^ Hermann, Michael; NK Quynh; D. Peters (1999). "Reappraisal of Edible Canna as a High-Value Starch Crop in Vietnam" (PDF). CIP Program Report 1997-98. Archived from the original (PDF) on 2011-09-27. Retrieved 27 November 2011. ^ Organic Gardening: How to Propagate Canna by Seed. Constructed wetland for on-site septic treatment.